The entire egg cylinder was embedded in methacrylate and nearly every 3µm slice was preserved on microscopic slides and stained with toluidine blue. The 22 high-resolution images below go from the lateral left side (slice 5), through the midline, to the lateral right side (slice 56). The illustration below shows the approximate cutting plane and location of slices 13, 30, and 50 on a transversely-sliced rat embryo at the same age. In place of repetitive comments for each of the slices, we will discuss the general characteristics of this embryo and provide no captions for the zoomified images below. The embryo itself is a U-shaped structure at the base of the egg cylinder. The uterine tissue surrounding the egg cylinder was erased from the image with photoshop, carefully preserving the double-walled yolk sac: endoderm on the outside, mesoderm on the inside. The space around the outer limits of the yolk sac wall is the yolk sac cavity. The embryo develops inside an amniotic cavity surrounded by a thin, double-walled membrane, the amnion: ectoderm on the inside and mesoderm on the outside. Both the yolk sac and the amnion have erratic folds caused by tissue shrinkage during fixation and dehydration prior to embedding. The nervous system is our chief interest, and most of the annotations in the images below refer to that. At this stage of development, the neural plate is open throughout the entire neuraxis from the forebrain part of the head fold to the area where the primitive streak continues posterior to the spinal cord. There is no neural tube, and no neurons have been generated. Instead, the dense cells in the neural plate are the stem cells that will generate neurons, glia and other cells specific to the nervous system—the neuroepithelium. The neural plate has a deep groove in the midline. In this specimen, the midline itself twists from posterior left to anterior right because the embryo turns as it grows. The midline in the brain is at a different angle than the midline in the spinal cord. 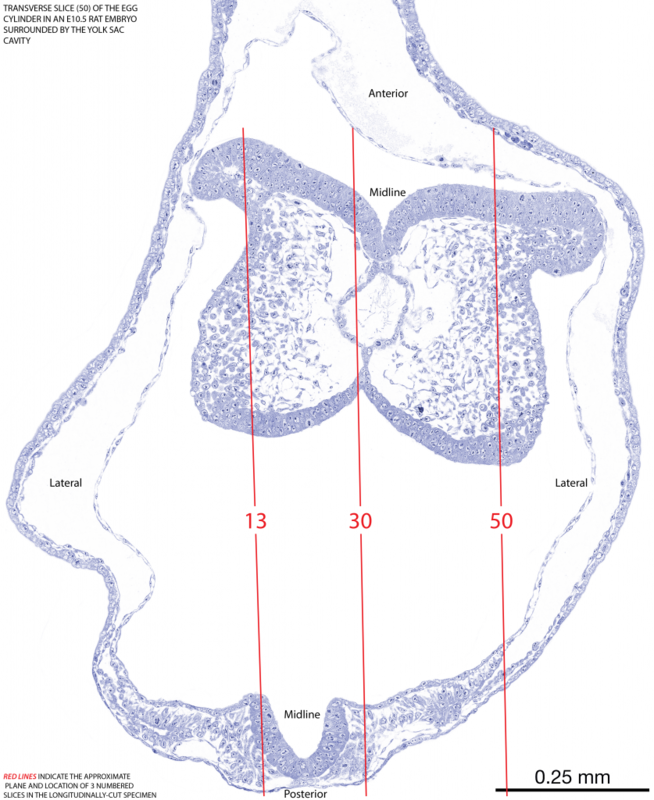 Thus, the low-numbered slices below cut the central spinal cord neural plate and the most lateral parts of the left side of the brain neural plate. The higher-numbered slices cut the right side of the brain neural plate, while the narrower spinal cord neural plate is out of the plane of the slice. The midline itself is not easy to see in longitudinal slices. However, the notochordal plate is visible in several as they cut across the midline, first posteriorly, then anteriorly. The notochord always marks the midline area and extends from the most posterior spinal cord to the midbrain. The anterior midbrain and the forebrain do not have a notochord, but they still have a deep groove in the midline. All of these structures are labeled in the slices below. By clicking on one of the thumbnails, a new tab opens in your browser that allows you to view the entire slice or to zoom to the highest magnification and see individual cells in the neuroepithelium. There is a navigator within the view window showing a box indicating what part of the slice is in the window. Move the box to an area of interest to see different parts of the slice, especially helpful at the highest magnification. Clicking on the “Z” at the bottom of the window returns the view to the entire slice.